Foxy has been dazzling us for many years with his fabulous online bingo site and games that everybosy loves. He is a bit of a dude and quickly became a household name. Now they have an extra treat in store for those of us that want to play slots, blackjack, roulette and more, in a classic casino environment. 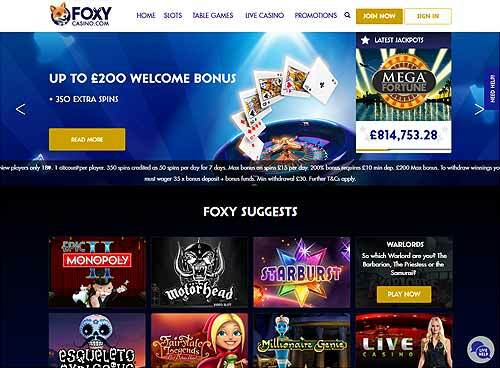 Foxy Casino is a new place, separate from the bingo and games rooms that they already have. This gives access to new people, new games and great new bonuses. The site itself is clean and welcoming, with all the games just a click away from the desktop welcome page. Just register, sign-in and start playing within minutes. Make your first deposit at the casino. Anything from £10 to £100 and you will be given a double match offer to increase your casino balance by up to £200. Deposit £20, play with £60 is a great welcome indeed. As soon as you have made your first deposit and claimed your free cash you will also be given another great freebie bonus. Each day for your first 7 days of casino life you are give 50 FREE SPINS to play on the designated game for the day. That's a total of 350 spins. Collect and keep up to &15 of winnings each day to add up to £105 to your bonus bank. A great new player promotion from a top online casino with all the best games. Everyday at Foxy Casino there are more offers to take advantage of. For example every Monday is FREE SPIN MONDAY with a 1 for 1 bonus... Every £1 deposited gives you 1 FREE SPIN on the new game BLACK WIDOW (from 20 to 50 spins). Foxy Casino offers the top jackpot games like Mega Fortune, Starburst and Irish Riches. Some of the jackpots can reach over £1 Million!! The banking is also really easy. You can use your debit or credit cards and bank transfer, but to make it really easy they also accept deposits and withdrawals via PayPal. The selection of games is incredible. There are over 150 differet slot machines, along with scratchcards and fixed odds games. You will also find table games like blackjack, roulette, hold'em poker, there are also live dealer games for that real casino feel. Foxy Casino is part of the Cassava Enterprises, that also runs 888 Casino and Wink. The gaming here is safe and secure and fully regulated with a UK license. You can be sure that the games are safe to play and regularly tested for compliance with fair gaming. Just click the links on this page to get your 200% double mathc and free spins.